rooted before the door, is familiar to every town-born child by the title of the Pyncheon Elm." In Dr. Heidegger's Experiment, two long time friends meet up to celebrate Heidegger's birthday while a storm rages. A bolt of lightening damages the door to the house's crypt and as as the two men investigate they discover that the body of Heidegger's fiancée has not withered in over thirty years - he begins the wonder if the water that drips in the tomb might have resorative properties. In Rappaccini's Daughter, young Giovanni Guasconti moves into an Italian town to attend the University. He falls for the mysterious Beatrice Rappaccini whose garden he overlooks, but she is very reluctant to meet with him and has some strange habits. In The House of the Seven Gables, Gerald Pyncheon and his young wife return to the family home, but Alice starts to act strangely and is concerned when she hears the legends around the house and the death of its occupants. Producer Robert E. Kent loosely adapts three tales by American horror writer Nathaniel Hawthorne in this anthology horror film. The first part, Dr. Heidegger's Experiment is probably the loosest of the three adaptations, taking the basic theme of a youth-bringing elixir and wrapping it into a neat little romantic tale. There is some good tension in the opening and the behaviour of Medbourne keeps the viewer wondering what is going to happen. Rappaccini's Daughter is a much closer adaptation and as a short story it is well suited to the anthology format. Lacking the scary moments of the other two chapters it does manage to build an effective mystery. The final chapter is certainly the most interesting, based on Hawthorne's novel The House of the Seven Gables. The adaptation is certainly quite loose, if nothing else because it has to be considerably compressed, a pity since the original story has a lot of interesting filmic potential. Still, Kent's version is an effective horror story with several quite scary scenes and a good climax, even in its cut down form it has enough potential to make a full film and is certainly the most effectively paced of all three chapters. Anthology films had become popular in the early 1960s, with Mario Bava's Black Sabbath (1963) and Roger Corman's Tales of Terror (1962) - like these two films, Kent does not provide a linking story, instead opening each chapter with a simple shot of a book being opened by a skeletal hand and revealing the title. This avoids the often quite tenuous and tiresome linking stories that became de rigueur in the later British anthology films and allows each story to get its full running time, although forty minutes does seem a little long particularly for the first two chapters and trimming down to thirty minutes might have kept the film flowing a little quicker (or allowed more time for the final story to develop). American Western veteran Sidney Salkow seems like a rather odd choice to helm the film and certainly if Kent was hoping to find a director to match Roger Corman's output he would be disappointed. Salkow's direction and the entire feel of the film are from a much earlier age and it is often hard to imagine that the film was not produced in the 1940s. Camerawork, set design and Richard LaSalle's score serve the film well but lack the flair of the Corman/Bava era - still, Salkow is able to build up a good atmosphere, particularly in the final story and there are several quite scary sequences. Vincent Price was America's biggest horror icon in the mid-1960s and much in demand from horror producers to add star name to their production. He gives a typically fine performance here in all three parts and seems to relish the variation in characters that it offers. A number of familiar faces including Brett Halsey (Demonia (1990)) and Richard Denning (Day the World Ended (1955)) provide solid supporting parts. 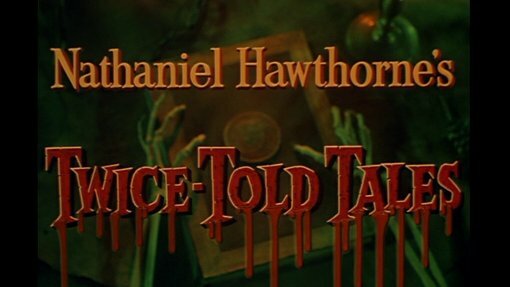 Well written and directed, Twice-Told Tales is an effective little horror film but one that is twenty years out of date in both its scripting and production style, it is very easy to imagine the film in the pastel hues of early Technicolor. Certainly of interest to classic horror fans and featuring a great tri-leading performance from Price, just don't expect any of the innovations of the Corman era. Who is it for? A solid little film, of interest to classic horror fans. Visuals Original Aspect Ratio - 1.66:1. Not anamorphically enhanced. Colour. Print quality is fine - good detail and colour, noticable grain. Audio English mono - sounds fine although rather quiet. Availability Available on its own or as a double feature along with Tales of Terror, both now out of print. Available as part of the 7 film Vincent Price Scream Legends Collection. Cuts? Believed to be fully uncut. Print is English. A well written but rather out-of-date horror anthology with a good leading performance from Vincent Price. Recommended to classic horror fans. A solid print with good audio. See our reviews of more films starring Vincent Price. All text in this review written by Timothy Young - 26th February 2010.